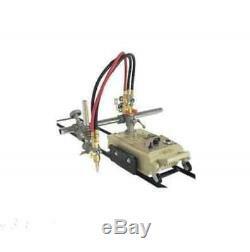 CG1 Gas Cutting Machine Torch track burner cutter. This is the improved version. 1, The main Body is made of aluminum of high strength by diecasting minutely. 2, Speed system is adjusted by controlled silicon. 3, Oxygen acetylene hose is made of high quality rubber with advanced process. 4, Attached quick connector for hose quick link. 5, Quick switch is attached in pipe assembly for higher efficiency. 6, Mainly for straight line cutting and for circular cutting>. Single torches cutting, groove range L. Applied in shipbuilding, oil production, metallurgy, metal structure and other manufactures ect. Supply voltage: AC220V 50Hz or 110V. Track: 2pcs Trapezoidal shape(the length is 180cm). 1set moving right & left assembly. 2pcs Trapezoidal shape(the length is 180cm). 1pcs circular cutting locating pin. 2, All our items is from the original factory directly. We promise the best quality and best after-sale service. The item "NEW Torch Track Burner CG1 Gas Cutting machine Cutter m" is in sale since Thursday, September 10, 2015. This item is in the category "Business & Industrial\CNC, Metalworking & Manufacturing\Welding & Soldering Equipment\Welding\Other Welding Equipment". The seller is "mywelllife" and is located in ShenZhen. This item can be shipped to United States, all countries in Europe, all countries in continental Asia, Canada, Australia.